Private Swim Lessons are available at Mesa Verde Country Club starting May 1st. Lessons run in 20 min increments, and are available from 10:00am- 6:00pm. Our swim instructors use an exciting, customized approach to cultivate a love and respect of the water in swimmers of all ages and levels. Private Lessons are tailored to meet the needs of each individual swimmer. Semi-Private Lessons- For no additional cost, customers can add a second child to any swim lesson time slot. This means that the main customer will book the class, and may add a friend or relative to the same class for free. If for any reason the instructor doesn’t feel that lessons should be split, they will let the main customer know right away. Reasons may include a major disparity in abilities between the two swimmers. 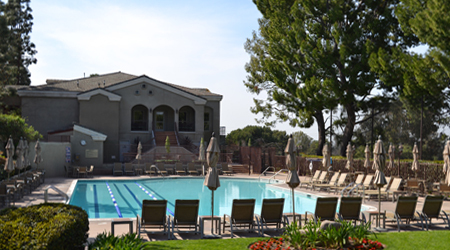 The Aquatic Center at Mesa Verde Country Club is located in beautiful Costa Mesa. Members of the Country Club can enjoy the different incentives that Premier Aquatics offers. On a weekly basis, Mesa Verde Country Club Aquatic Center is guarded by our awesome Premier Lifeguards. These lifeguards are all qualified and trained to overcome any situation. Their primary goal is to keep pool-goers safe and comfortable. They act as superheroes around the water. Members of the Mesa Verde Country Club are able to book birthday parties at the aquatic center as well. Splashing around in the pool and soaking up the sunshine is a fun and enjoyable way to spend any birthday! Country Club members are able to have private lifeguards at their birthday parties, to ensure that all individuals attending the party are able to have fun in a safe way. Whether you are interested in having a fun day by the pool, learning to swim through one of our swim lessons programs, or staying conditioned and competitive on swim team, the Mesa Verde Country Club Aquatic Center in Orange County is the place to be! If being a lifeguard or swim instructor at the Mesa Verde Country Club is something that interests you, please visit our website at www.swimoc.com/careers for more information on available jobs and how to apply.